Fr. 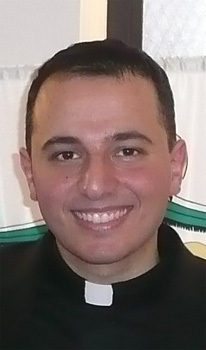 Fouad SabaCarole Buleza interviewed Fr. Fouad Saba of St. George Church in Cicero, Illinois about developing his parish bible study course, and about his Holy Land Heritage. Those who attend Fr. Saba’s course will receive a packet of materials to assist in the establishing of a parish bible study program. 1. At the Orthodox Institute, you'll introduce the bible study course that you developed for your parish. How often do you meet and what keeps the participants coming to the class? The St. John Chrysostom Academy (JCA) meets twice a year (Spring and Fall usually). Each session or semester is 8 weeks long. Each of the 8 classes is two hours long with a short break. I give informational quizzes and a final exam to give people the sense of where they are in understanding the course material. Most of the semesters have had Scripture books as the course topic, but we have done some courses on Worship services, the Liturgy in particular, Byzantine Chant, etc. The most attended courses have been the Scripture courses, especially when we taught "Revelation," "Genesis," "John," and others. The courses, perhaps, have been appealing to people due to the detailed nature of the course, dealing with almost every verse of the particular book and discussing the basic meaning of the words and passages, sometimes using the original languages of Scripture: Hebrew and Greek. 2. What personal experiences with Scripture inspired you to want to teach? At a very young age, my parents helped me learn Scripture through them reading it to me constantly. My father would tuck my sister and I into bed and as he did after a 14 hour work day, he would tell us the story of the birth of Christ in details, almost verbatim from the Scripture. The power of the narrative is what led me to ask him to repeat every night for many months before moving to other passages which he gladly told me. As I grew older I read the Scripture as a story. I had trouble understanding everything due to my sporadic attendance in Sunday School, but my father would seat me down next to him with his Arabic Bible and my English Bible and he would read his and I mine, explaining the passages as we went along. This personal experience with my father lives with me as I now read the Scripture to my daughter, fulfilling the original intention of Scripture: retelling the narrative from generation to generation, so we may know the "Lord our God." 3) Can you share about your background and education? As for my background, my family originates from the Holy Land, from the ancient city of Lydda, which today is the shrine of the Tomb of the Great Martyr George. My parents' families fled the war of 1948, from Jaffa and Jerusalem respectively, to Lebanon and Jordan. My parents were married here in Chicago, where I was born a few years later. I grew up on the North Side of Chicago, working in my father's meat market since the age of 8. I was baptized at St. George Church, Cicero, IL and joined SOYO as a teenager, which led me to be more involved in Church in other aspects. I received a B.A. in Biblical Studies from North Park University in 2003 and a Master's Degree in Divinity from St. Vladimir's Seminary in 2007. It was at St. Vladimir's Seminary where I seriously began learning the Scriptures as an adult. My inspiration was and still is the V. Rev. Dr. Paul Nadim Tarazi, who truly has started a modern Scriptural revival in the Orthodox Church in this country and abroad. As St. Paul the Apostle told his disciple Timothy, "Till I come, attend to the public reading of scripture, to preaching, to teaching." (I Timothy 4:13) For the Apostle has taught us about the ultimate Teacher who also gave His life for His disciples, and we, too, must now teach as he taught about the Teacher, so we may know what it is we "give thanks" for.